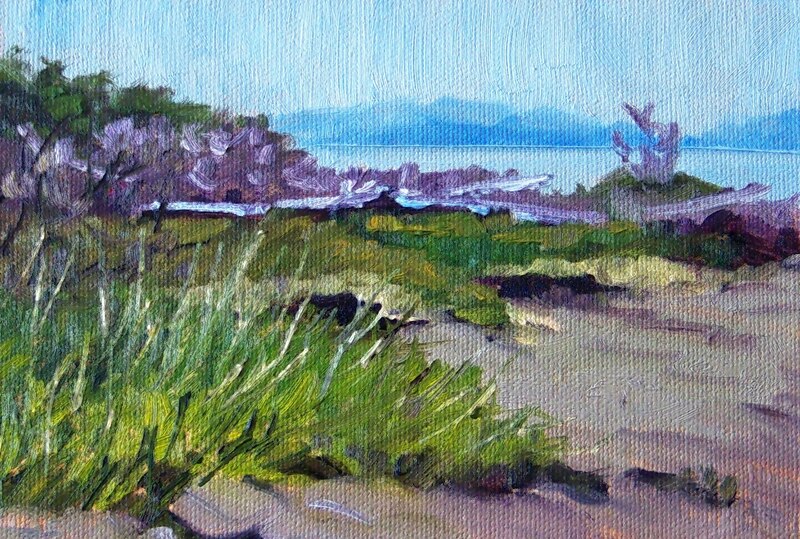 This little oil painting is based on a photo I took at Ocean Shores, Washington. The beach near the North Jetty is eroding. This particular area used to be one where a person could walk directly from the main rode to the beach on a smooth, flat path. After a couple of years of wild storms, there is now a big cliff where a smooth walk to the beach used to exist. Recently I read an article that stated it is more likely coastal communities will fall into the ocean as a result of erosion instead of being drowned by the rising sea level caused by global warming. I wonder which theory will prove to be reality. In my dream world, neither will happen and we will all live happily ever after. If only dreams came true. A trip to the farmer's market today resulted in some wonderful winter apples and a painting, too! 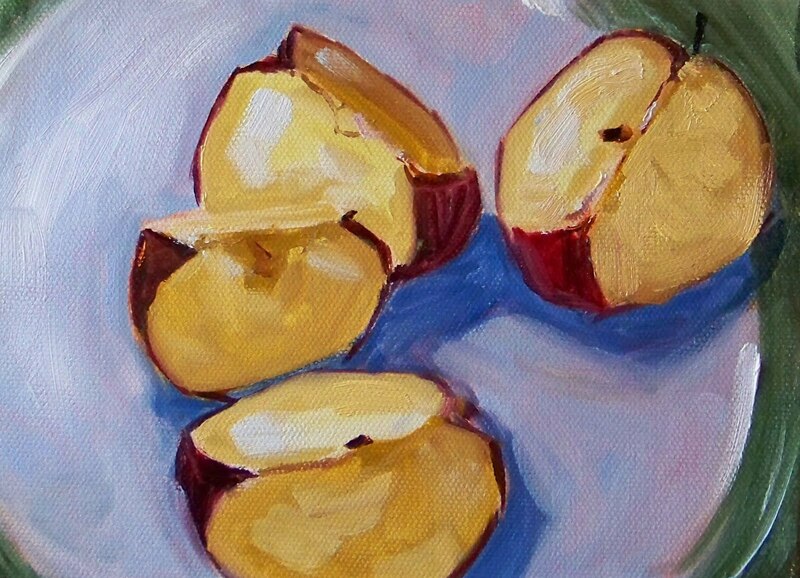 The apples were so fresh and crunchy, I had to hold back so I would still have one to paint. 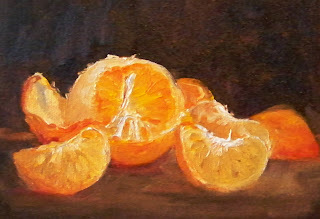 The result is this 6x8 inch oil painting, a fun project for a Saturday afternoon. 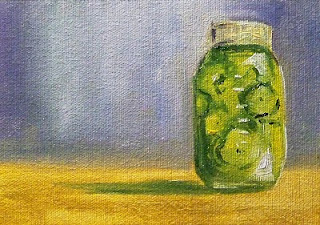 Click here to view it in the Small Impressions Gallery at Etsy where it can be purchased for $75.00 plus shipping. The weather has been horrible lately, so I've been drawn to painting sunny landscapes. Today I gave up and embraced the gray of the Northwest. I actually enjoyed painting this 9x12 inch landscape of a pond near my house. The scrapings from my sunny pallette created a wonderful array of grays that worked well for a winter landscape. With no break in the weather in sight, a few more of these winter landscapes could find their way onto canvas in the next few weeks. Looking out my window at weather that is well below freezing, I am anxious for sunshine to return. Tired of gray weather, I reviewed some old photos looking for some inspiration. 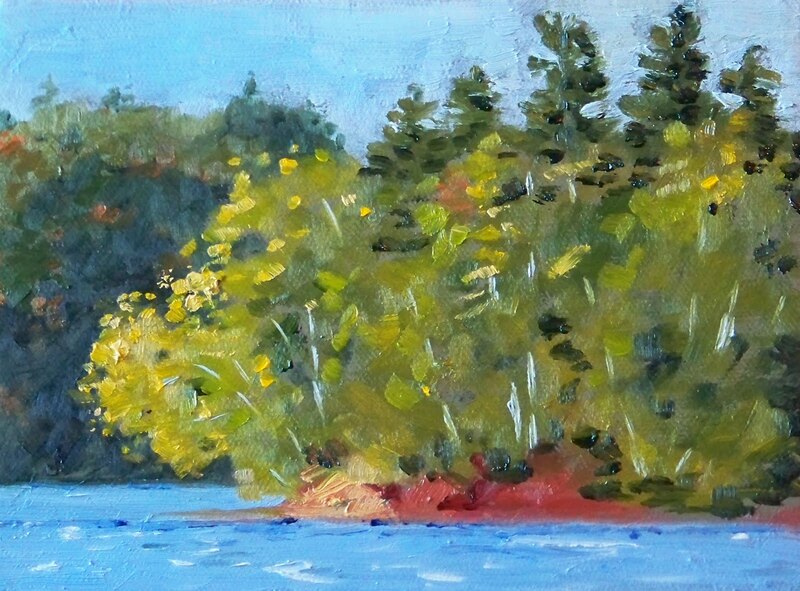 The photo this 9x12 inch oil painting is based on was taken in September several years ago. 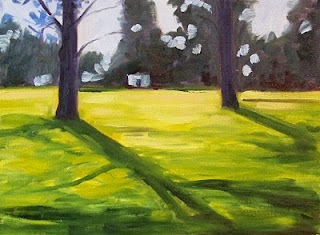 A bright autumn afternoon with the long shadows beginning to drape across the landscape of a nearby golf course brought the inspiration I was looking for. When I painted this little 6x8 inch landscape, I was thinking about the evergreen trees of Washington State. We have miles and miles of them, especially in the mountainous areas of the state. They are the darkest of trees to paint, but when the sunlight hits them, they are bright and wonderful. It is no wonder that these are the trees we look to for our Christmas Trees. 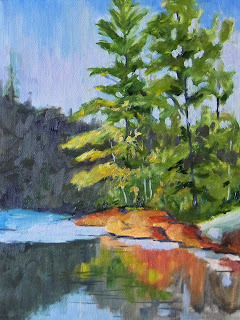 This painting which is on a gallery-wrapped canvas can be purchased online for $75.00 plus shipping at the Small Impressions Gallery. 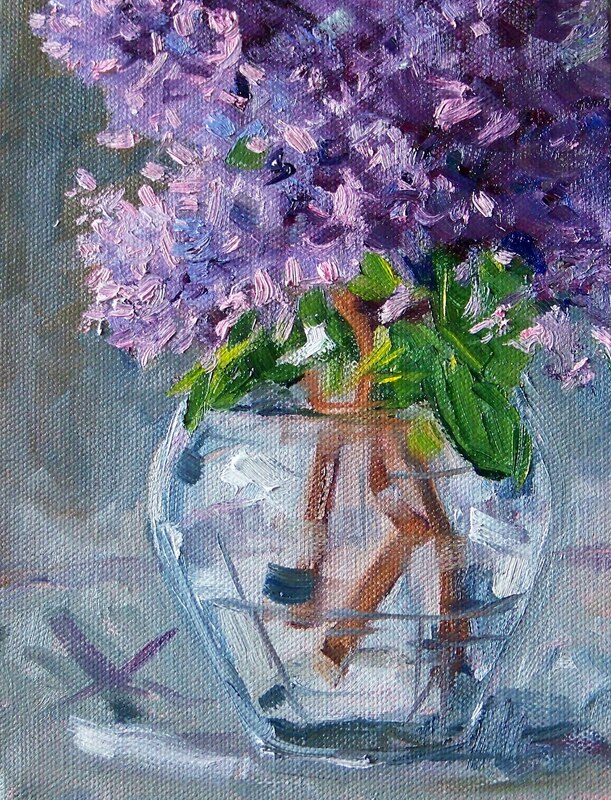 With the gray, cold skies outside, my inspiration today came from photos I took last summer when the lilacs in my backyard were blooming. It helped me recall days of sunshine and the delicate scent of lilacs. This painting is 6x8 inches on a gallery-wrapped canvas. It has joined some of my other floral paintings for sale at Etsy and can be purchased online here for $75.00 plus shipping. It is during the winter holidays that these sweet little tangerines come into season. 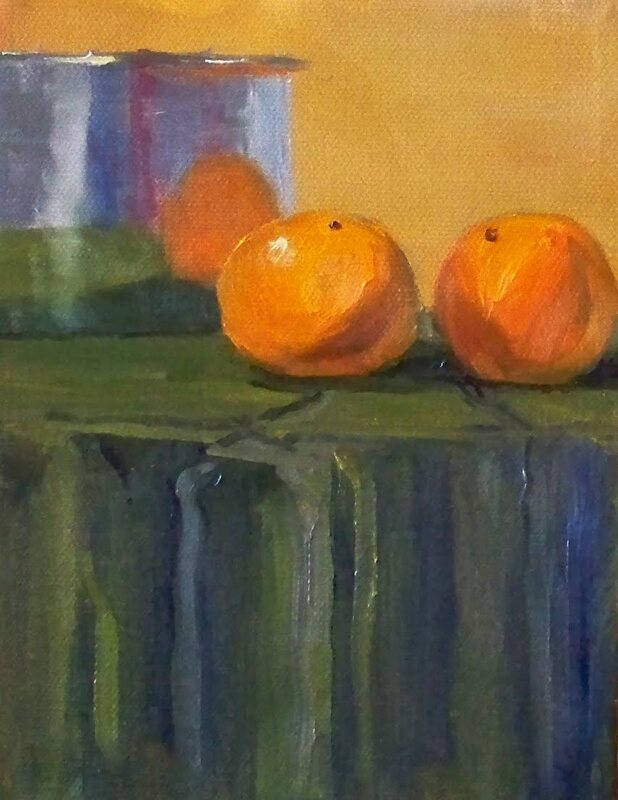 This oil painting is 11x14 inches on a 3/4 inch gallery-wrapped canvas and represents the custom in our house of enjoying these little oranges during the holiday season. I stretched and prepared the canvas, a process I used to enjoy. Beginning with raw canvas, stretching it, applying gesso, and then creating a painting is quite a time-consuming process. I find myself more and more just wanting to paint and skip the preparation process. Asking for a few dozen commercially prepared canvases for Christmas sounds like a wonderful idea. 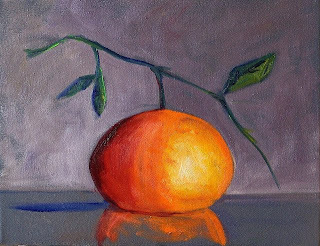 This painting is now for sale at the Small Impressions Gallery along with some of my other fruit, tropical fruit, and still life oil paintings. It can be purchased here for $145.00 plus shipping by clicking on this link. 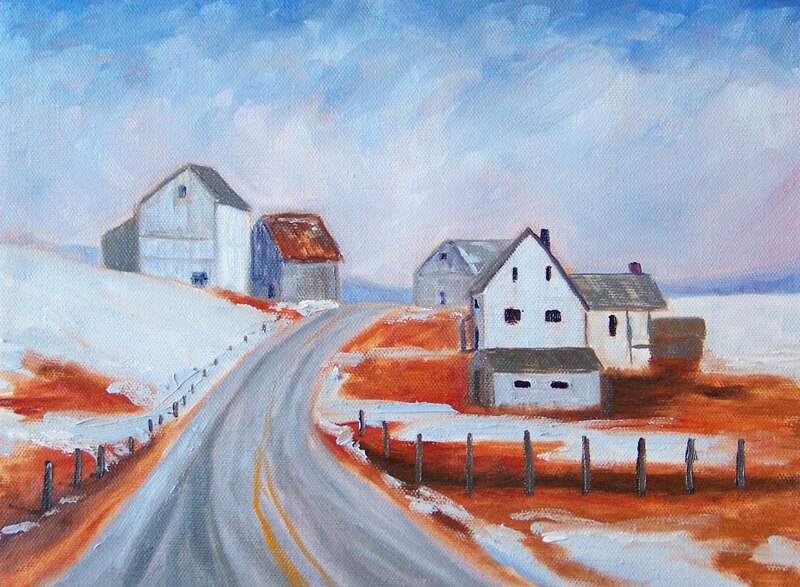 The cool colors of winter seems to be eminating from my palette these days. A frozen lake, a dark night, and the yellow lights from a distant home inspired this little 5x7 inch landscape oil painting. 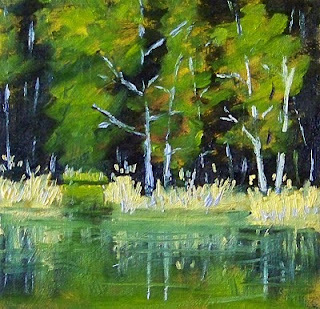 It is now for sale at my gallery, Small Impressions Paintings, at Etsy.com. 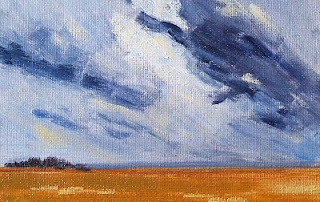 It was created on a hand prepared gessoed hardboard panel that will insure the painting lasts a lifetime. 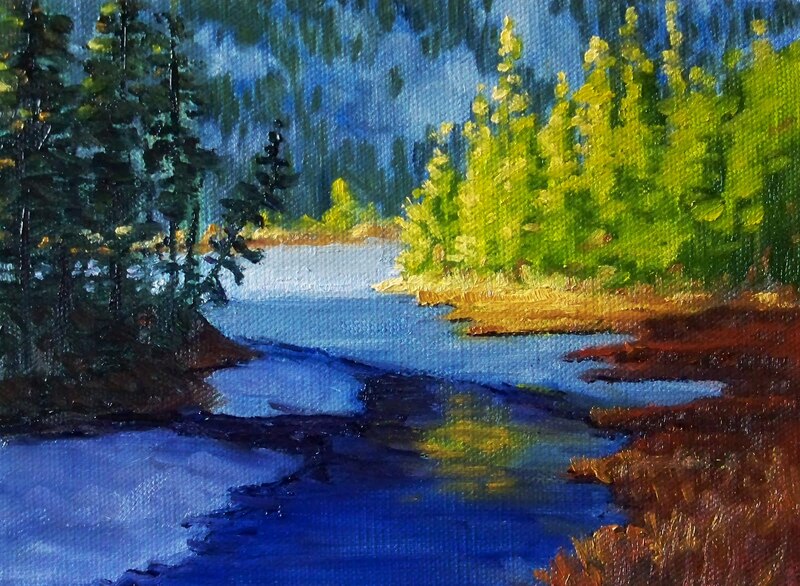 Visit the gallery if you'd like to purchase this painting for $50.00 plus shipping, or you might like to see some of my other original landscape oil paintings. With the time change, winter sunsets come early. It has been cold and wet and now nature's lights are turning off early, too. This little 4x6 inch painting was inspired by the view from my living room window. 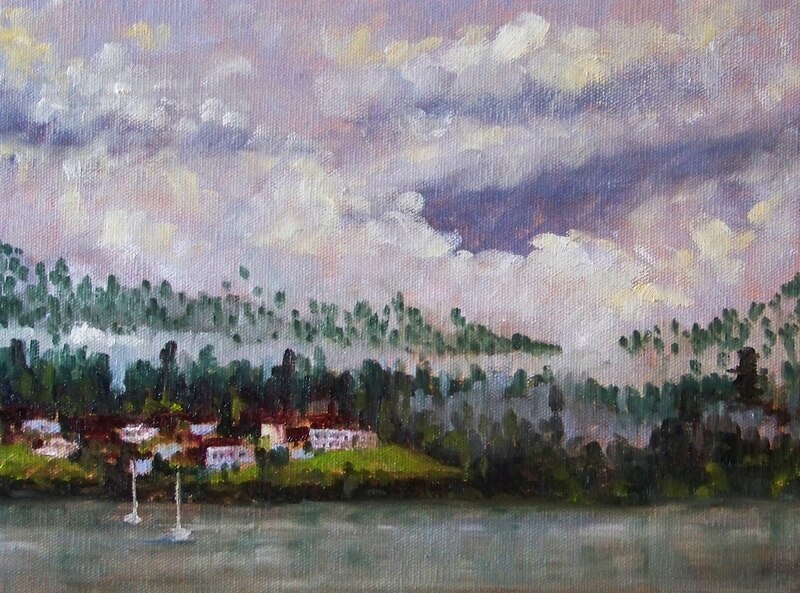 I love to watch the storms move across the sky and view Fox Island and the Key Peninsula across the sound. The poplar trees were golden for several weeks, but that is coming to an end as we enter the wet and wild month of November. The trees that carried such beautiful color just a few weeks ago are bare now. The reflection of their color in a pond near my house was my inspiration and I wish the spark of color were not quite so brief. 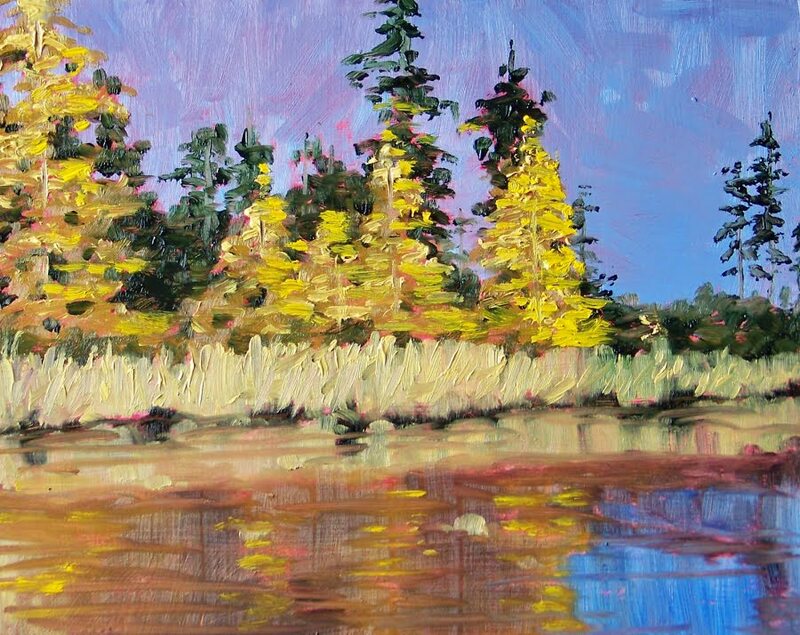 I'm glad to have this little 5x7 inch painting to remind me of the beauty of an shiny autumn afternoon. It can be purchased online at Etsy for $50.00 plus shipping. Click here to view it. 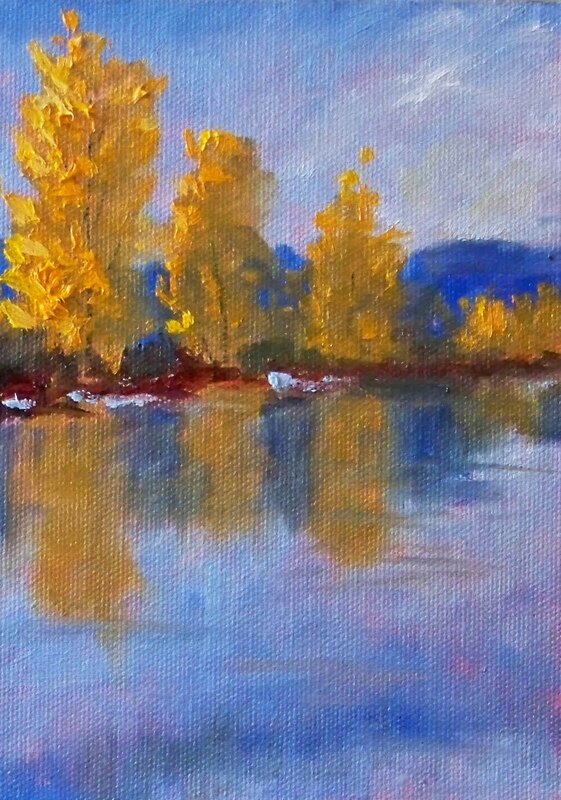 A favorite painting from today's efforts is this little 5x7 inch landscape oil painting. 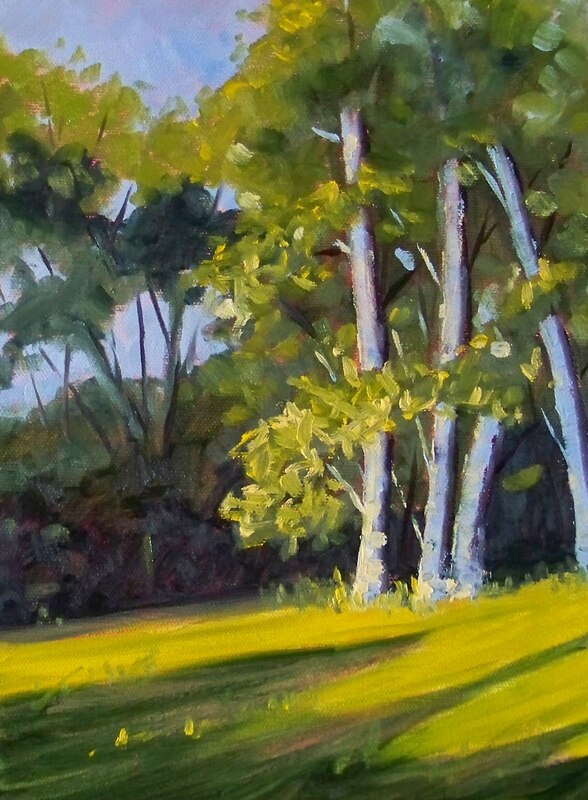 I liked the way the light glanced across the top of this trio of trees. The contrast between the warmth of the sunshine and the coolness of the foreground is what caught my attention. I've enjoyed taking this little vacation from still life work back to painting nature. This painting can be purchased for $50.00 plus shipping at the Small Impressions Gallery on Etsy. Click here to view it in the gallery. 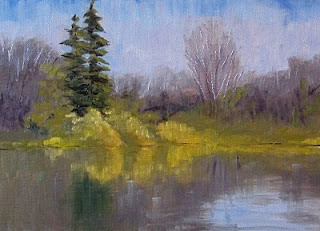 Another sunny day in the Northwest provided inspiration for this 5x7 inch oil painting. It seems we have a day of sunshine followed by several days of rain. I'm hoping the current sunshine holds on for more than just a day. 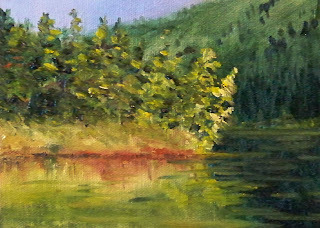 This painting is for sale online at the Small Impressions Gallery at Etsy for $50.00 plus shipping. Click here to view in the gallery. Yesterday with my bicycle loaded on the back of my car I headed toward the town of Puyallup where the Foothills Trail begins in Western Washington State. Before I got there, the rain began to pour down. Back home a few minutes later, I spent the afternoon in my studio with the gray skies looking over my shoulder and rain pelting the window. It was with great excitement that I rose today to sunshine. The clouds had cleared and the sky was blue. With my bicycle loaded on the car once again, I made a second try. Beautiful sunshine followed me the entire day. When I finished my ride, I was so inspired by the burst of autumn sunshine, that I painted this 6x8 inch oil painting. It is amazing what a little sunshine can do. The painting is for sale online at the Small Impressions Gallery for $75.00 plus shipping. Click here to see the painting in the gallery. 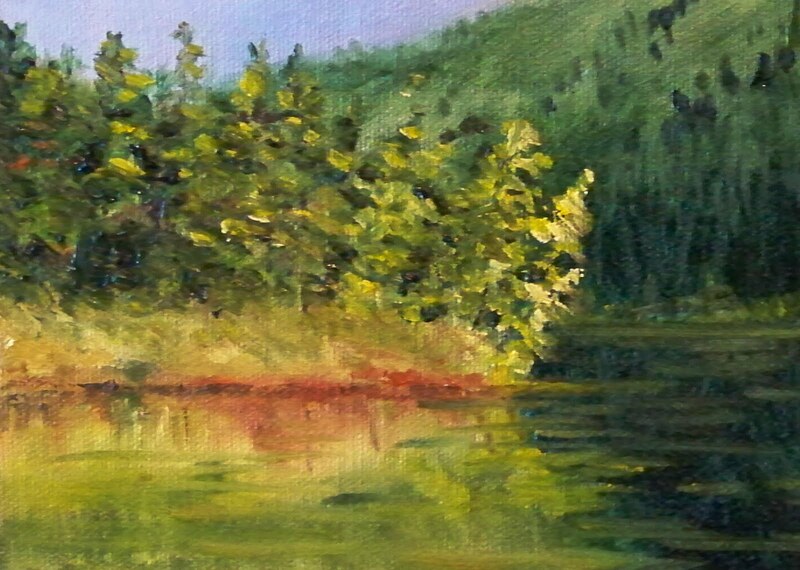 Painting the reflections on the lake was fun, but photographing this painting afterwords was a challenge. I have found that there are only a few hours of daylight that will allow for a decent photo. My studio faces west and by late morning, the light is too direct. The wet paint catches the light and the photos have little white reflections glaring off the surface. I ended up having to wait an extra day to snap a decent shot. 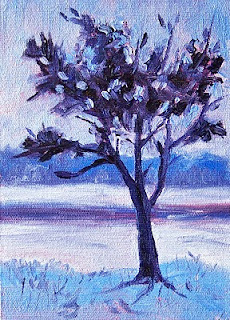 This little 5x7 inch painting can be purchased online for $35.00 plus shipping from the Small Impressions Gallery at Etsy along with some of my other small landscape oil paintings of trees. Click here to purchase. It has been a while since I've painted one of my favorite subjects, sheep. 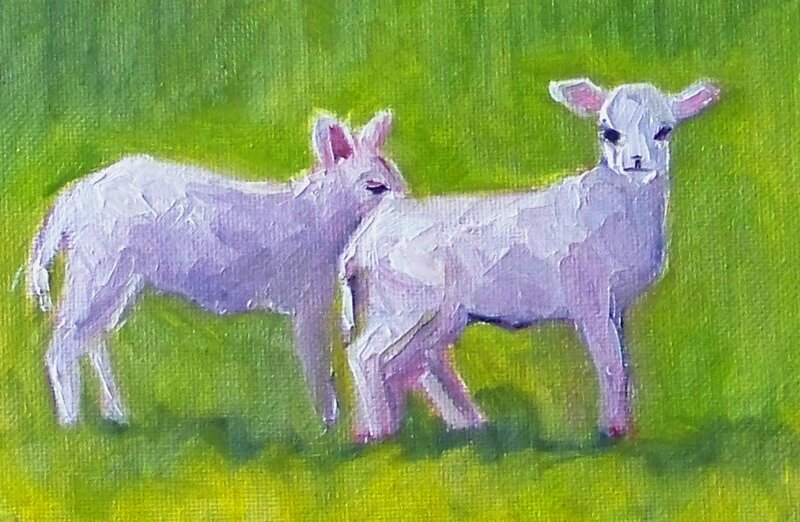 These little lambs were created on a 4x6 inch canvas panel and have joined some of my other small animal paintings in my Etsy Gallery . 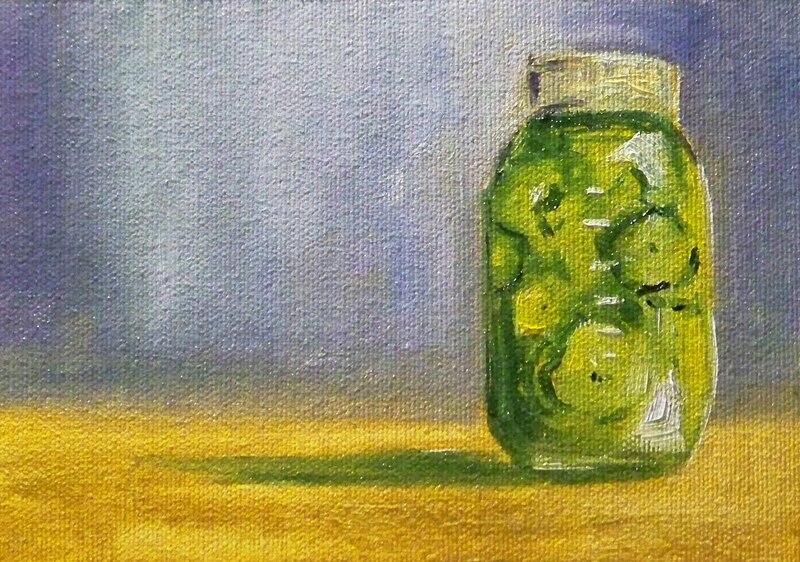 This little painting can be purchased here for $24.00 plus shipping. I'm still longing for warm weather and those long shadows that appear across the landscape on late summer evenings. This painting is 9x12 inches on a stretched canvas and was based on a photo I took at Titlow Park in Pierce County, Washington last summer. The park is adjacent to a wonderful beach on Puget Sound and is one of many places I often visit on the warm summer evenings. 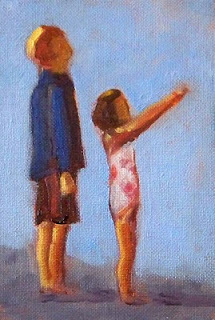 This 5x7 inch oil painting of a father and his daughter was based on another of my beach photos. It was so touching to see the two of them together on a misty beach watching a kite climb higher and higher. As the rain pours down and the wind blows, I find myself looking at photos I took when the weather was much better. 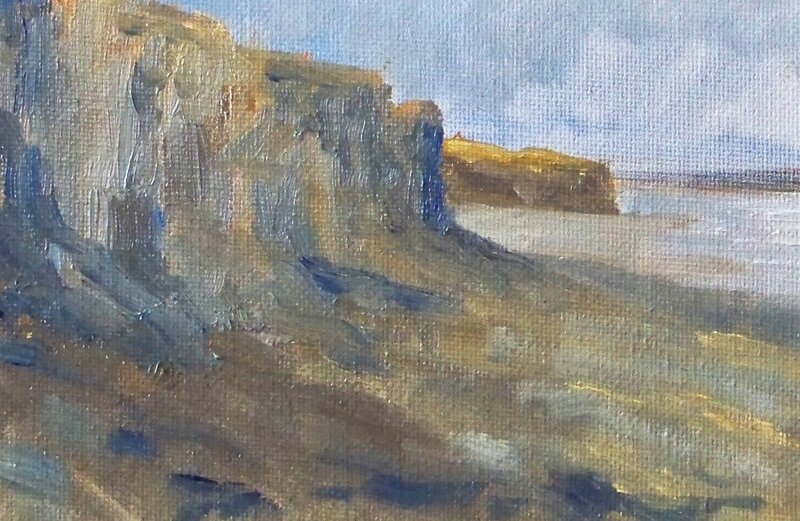 This little 5x5 inch study was based on a photo taken several summers ago on a visit to the Pacific coast. I was attracted to the brilliant blue of the sea and sky. 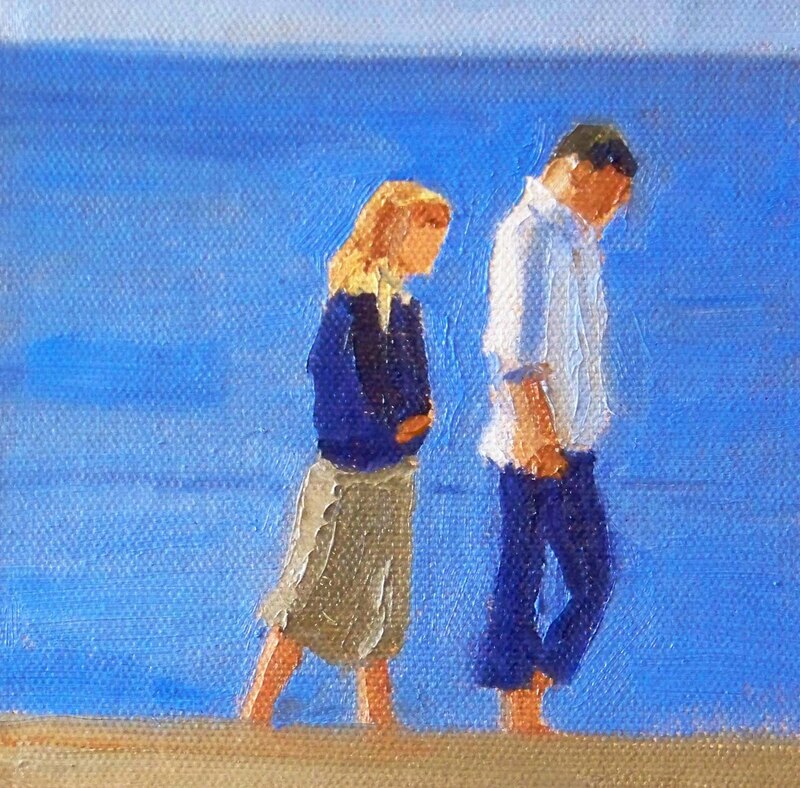 It was especially nice for the couple to stroll by and provide a focus for my study. 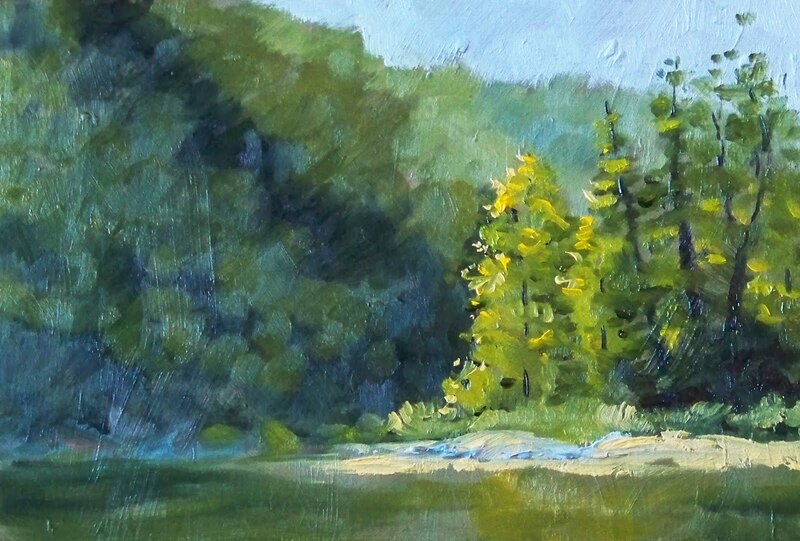 It has been a while since I've painted a landscape, but this morning I got up and was drawn to the task. The dark shadows and the dry grass on the river bank had a nice contrast that encouraged my efforts. 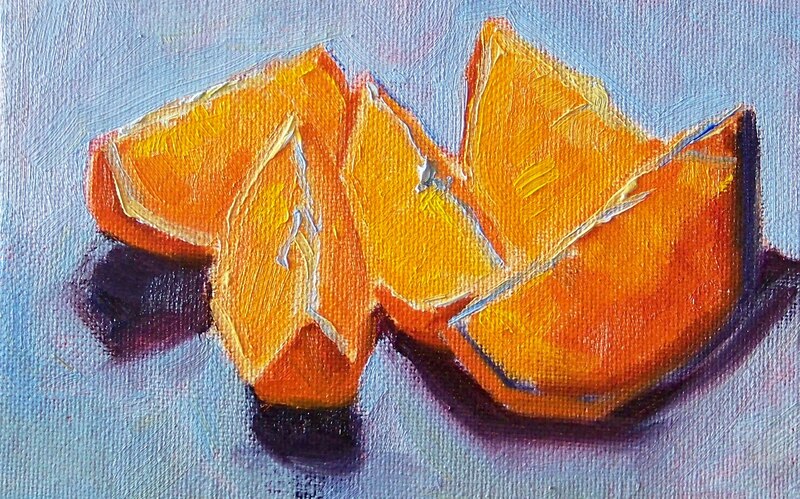 The painting is 6x6 inches oil on canvas and was a fun little diversion. Tomato season is officially over in my garden. The plants have been removed and the garden tilled. Those Sweet 100 cherries and the Early Girl delights have been banished and the last of the produce is now sitting in my kitchen. Until next summer I will have to be content with tomatoes imported from elsewhere in the world. It was with sadness that I painted this last tribute to the bounty of my garden. 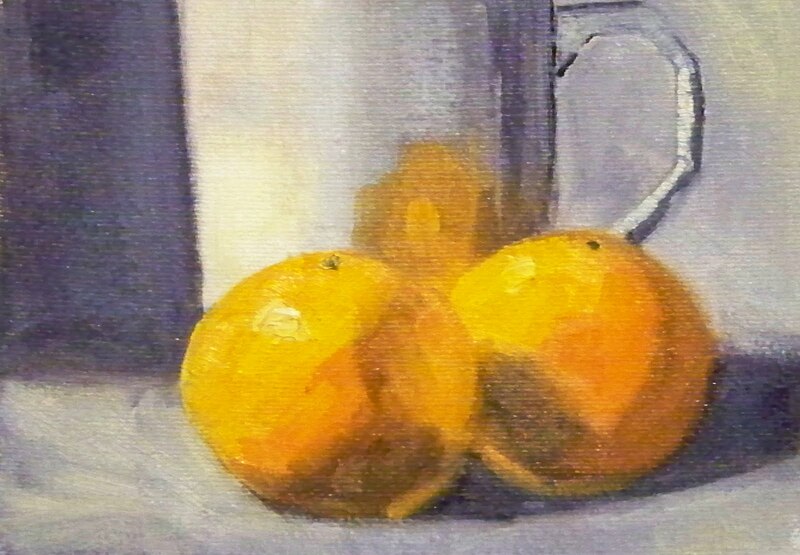 The painting is 5x7 inches. Visions of things to come. The news casters are reporting an upcoming severe winter in the Pacific Northwest this year. 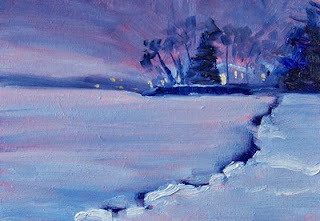 With that in mind, a snow filled painting seemed like the thing to do. 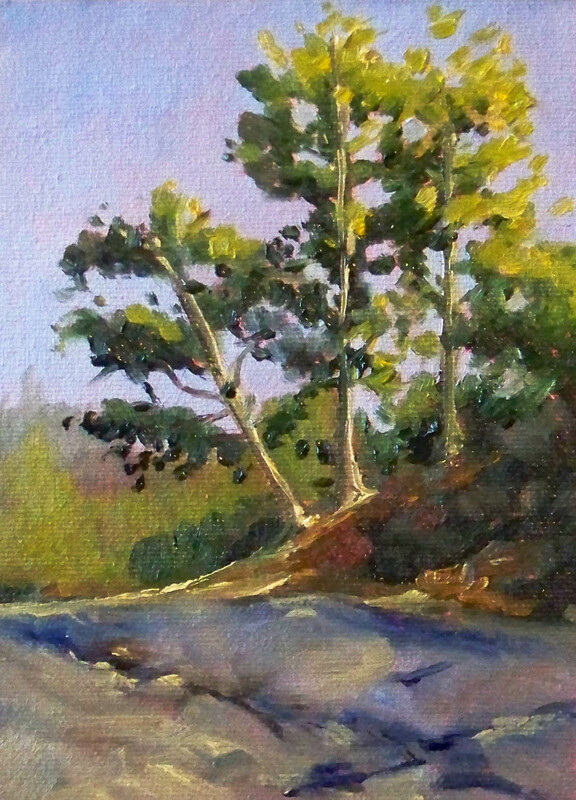 This one is 5x7 inches. 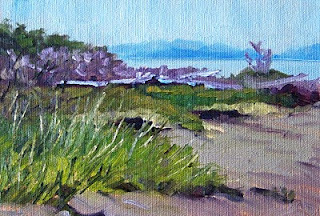 A view of Damon Point on the north side of Gray's Harbor in Washington State is the source for this little 5x7 inch oil painting. I tried to capture the cool misty air that hangs on the shoreline most of the time. Though the beaches in Washington State see the sun, it is much more common to experience cool mist and breezy air when visiting. Wear warm clothes, have a hat handy, and keep some gloves in your pocket. These beaches aren't for lounging in the sun, but can still provide a delightful solace. While the rain poured down this past weekend, I looked for inspiration in some of the photos I've snapped during the past year. I discovered a series of photos from a bicycle trip early in the spring. This painting is based on a photo taken of a field of cattle. 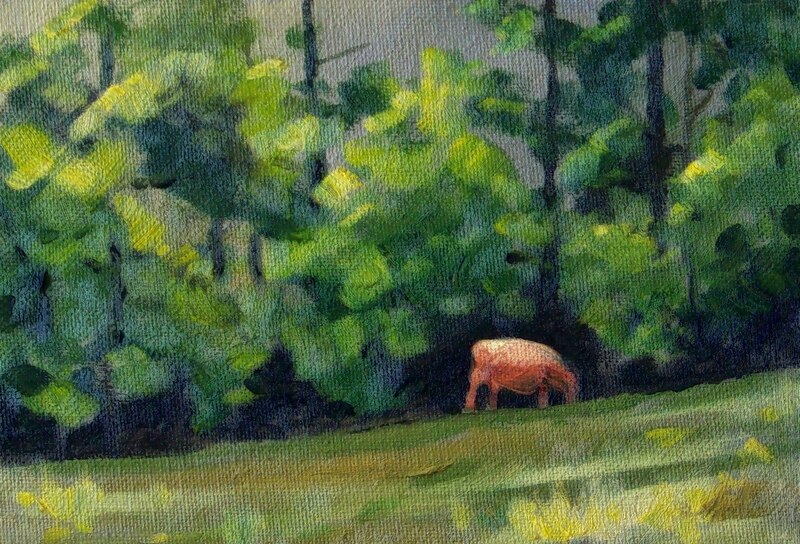 I was impressed by the sunlight on the back of this cow as she stood in front of a line of trees. The contrast between her golden hide and the shadows of the trees behind her is what captured my attention. 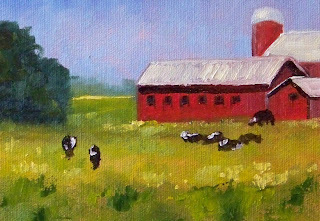 Remembering that delightful afternoon provided inspiration for creating this little 5x7 inch painting. Nothing like recalling sunshine on a rainy afternoon. This is another of my little ceramic cup studies. 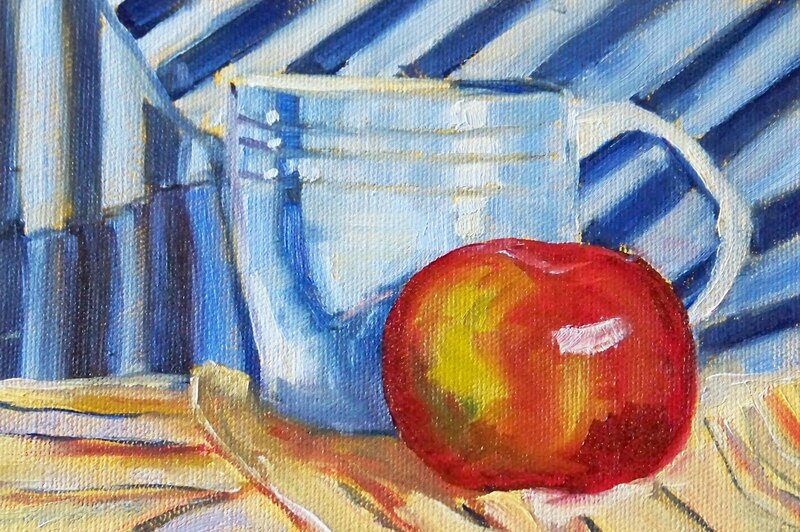 Working on those reflections was fun and I added a collection of stipes for a little extra challenge. Though I like the way the cup turned out, I'm going to have to stop myself from picking the rest of it apart. 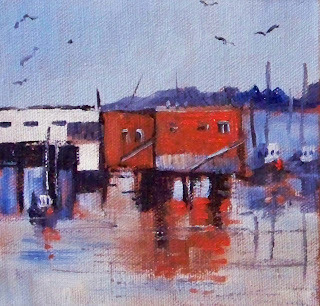 The danger of fussing to much is that sometimes rather than getting better, a painting can get worse. Knowing when to stop is a trick that I'm always working on. With the rain pouring down, I have a great excuse to lock myself in my studio and paint. Today's effort was a focus on the light on a couple of ceramic cups. 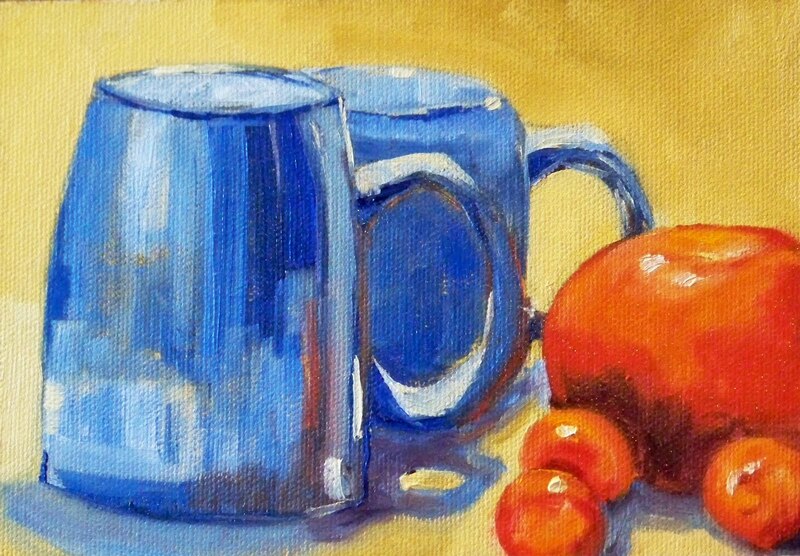 I included the tomatoes because they add a great reflection to the side of the cup. 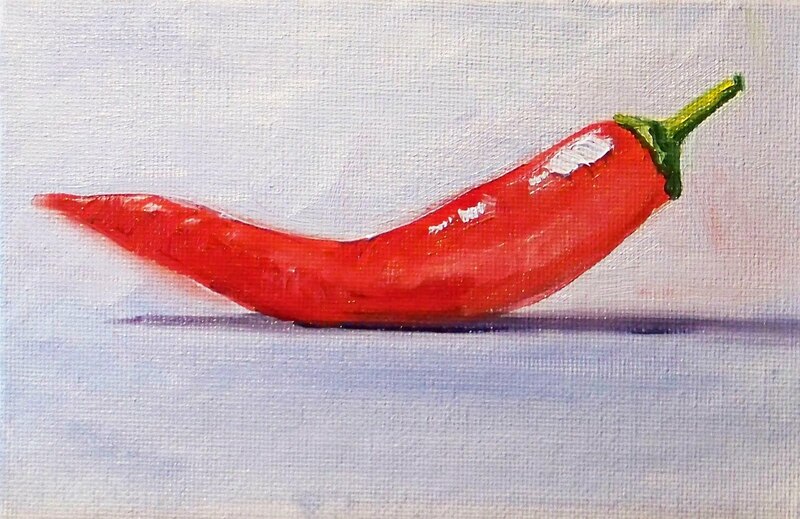 The red color winks and makes it fun to paint. 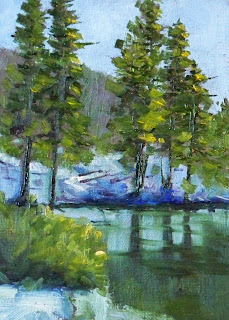 This painting is 5x7 inches on a Raymar canvas panel. 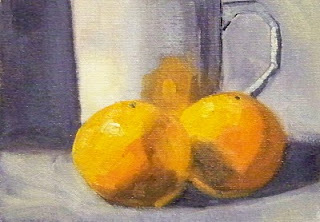 Eventually it will probably be listed for sale with some of my other small still life paintings. 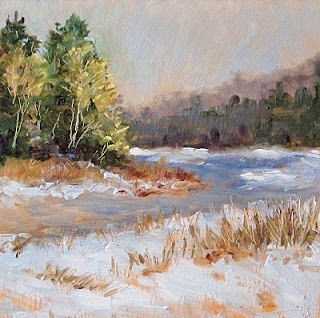 Depending on the size and quality of the surface, my small originals usually range from about $24.00 to $145.00 for paintings from 4x6 to 11x14 inches. 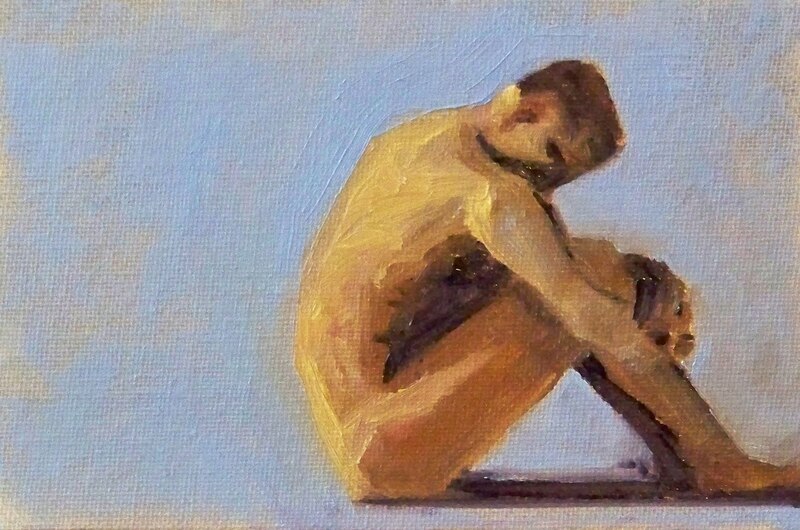 Before I begin a painting, I like to reflect on how I will approach the subject. I always consider what kind of wash I will use, what kind of underpainting will take place, the color choices, mixes, composition, and what feels like a million other little decisions. 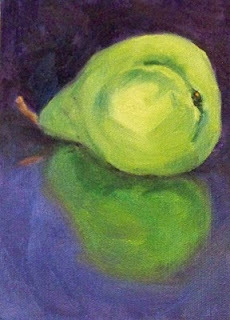 This 5x7 inch pear painting represents those moments before I begin to paint when I'm contemplating the task before me. Sometimes a painting seems to create itself. Other times, not. Sometimes it turns out as planned, and sometimes I discover my plan was not well conceived. As I reflect on the outcome of my efforts, I can already see some changes that I want to make. Perhaps the subject will emerge again in a somewhat different composition, on a different size surface, with a different color combination, or with a different tint to the initial wash. 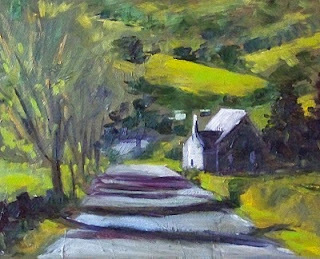 There are a million choices that make painting a wonderful challenge, one I continue to enjoy day after day, painting after painting. 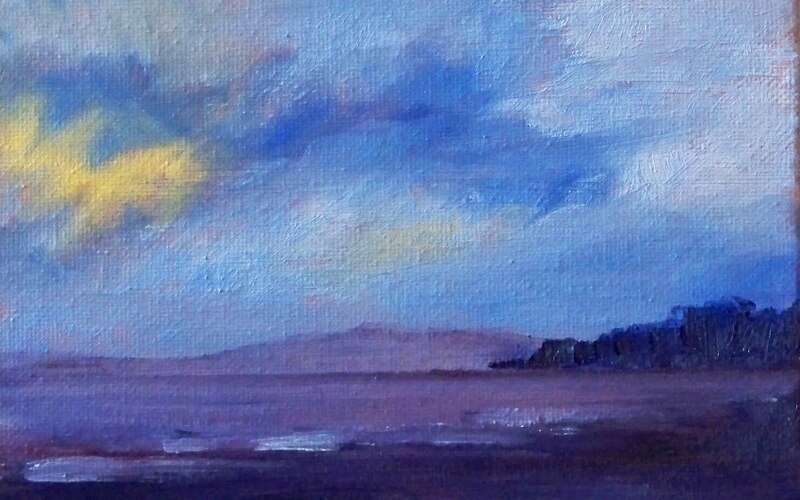 When it dries, this painting will join some of my other small paintings at the Small Impressions Gallery at Etsy. Until then, I will be reflecting and preparing for my next challenge. After a very busy week, it felt good to get back in the studio. This little painting seemed to jump off my brush. I love it when the painting is easy because there are a lot of days when it comes hard and nothing seems to go right. The painting is a small 4x6 inches and I noticed when adding the photo of it to my collection, there are a number of other little paintings that would make great companions. This one and this one are two of my favorites. 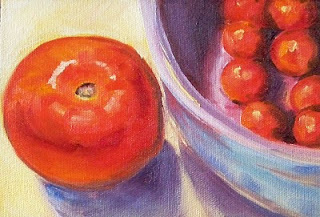 I love to create fruit still life paintings.